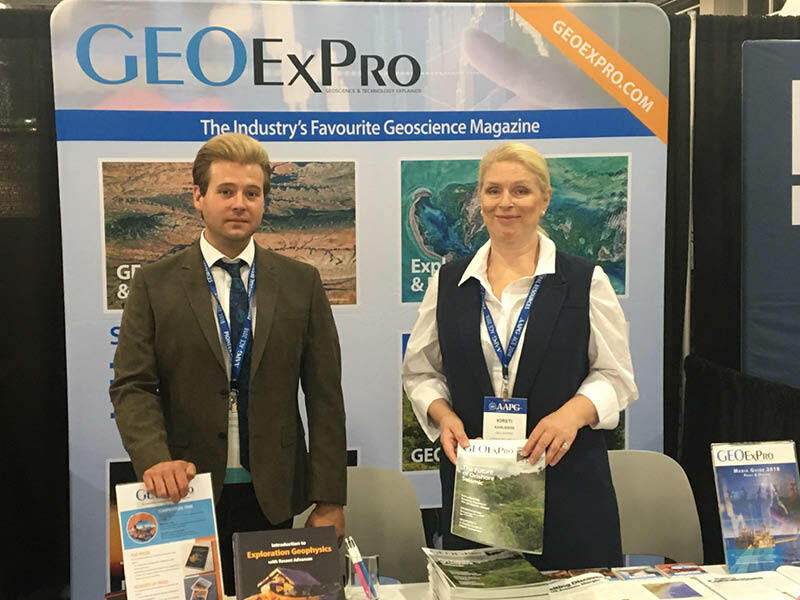 GEO ExPro's Conference Round-Ups: AAPG Annual Convention & Exhibition 2018 in Salt Lake City, Utah, USA. Beautiful backdrop of the snow-covered Rocky Mountains and clear blue skies. Photo credit: Jane Whaley. What better location could be found for a meeting of geologists? 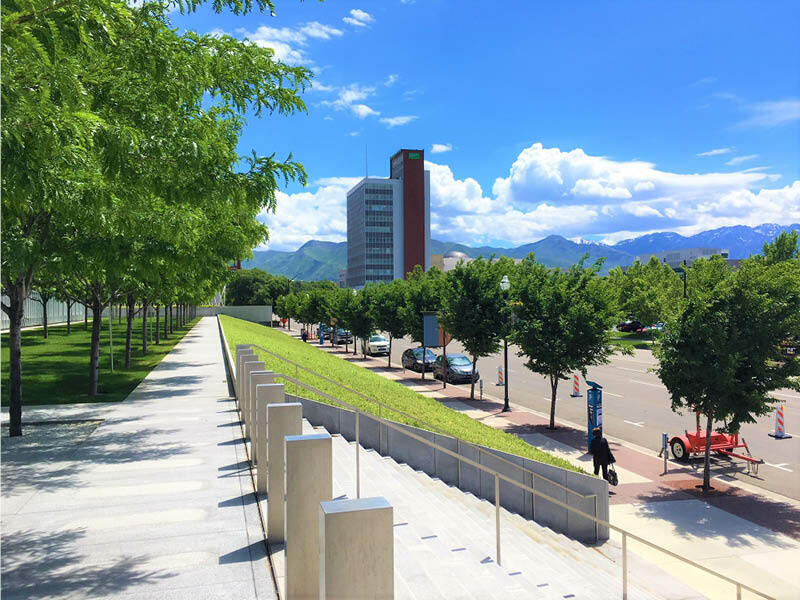 This year’s American Association of Petroleum Geologist’s Annual Convention was held 20 – 23 May in the Salt Palace Convention Centre in wonderful Salt Lake City, with the spectacular backdrop of the still snow-clad Rocky Mountains. The AAPG last held their annual meeting here in 2003, so a return visit was well overdue. The excellent field trips are always a popular aspect of the convention and with such a location the organisers must have been spoilt for choice. They ranged from local day trips to journeys of several days which took in such fascinating locations as Bryce Canyon and Monument Valley. Nearly all the trips were sold out, and by all accounts, an enjoyable and informative time was had by all participants. Not only do the AAPG choose excellent locations, but the calibre of the field trip leaders is always first class. 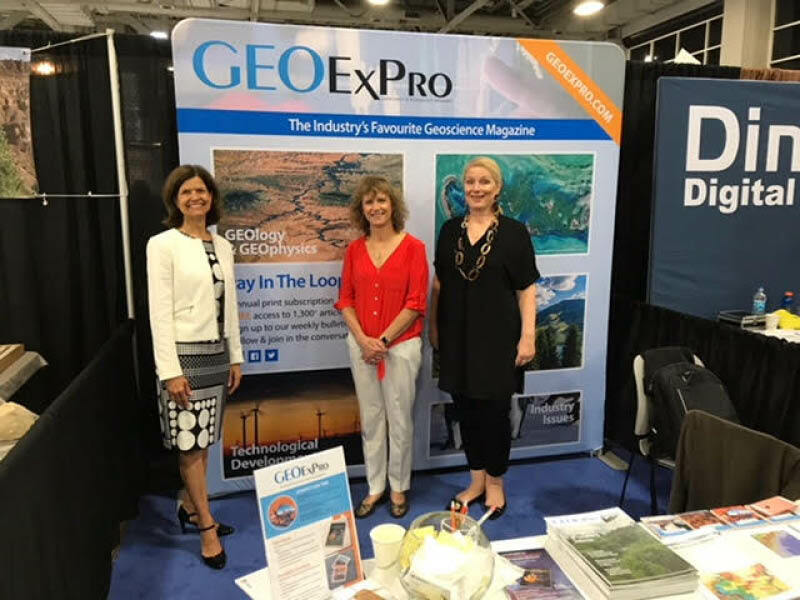 Sales & Marketing Manager, Kirsti Karlsson (GEO ExPro) & Jane Whaley, Editor in Chief (GEO ExPro) with President-Elect of the AAPG, Denise Cox. Photo credit: Jane Whaley. The meeting got off to an entertaining and unusual start when General Chair Michael vanden Berg appeared to be about to address the Opening Ceremony from the ski slopes! A bit of speeded-up downhill skiing, a quick tram ride and a rapid change of clothes, and two minutes later a slightly dishevelled Chairman appeared from the back of the room. There is nothing like a touch of humour to set proceedings off on the right foot! As ever, there was a very interesting range of talks with a number of themes, ranging from siliciclastics and lacustrine systems to energy innovation, with something to attract just about any geoscientist in the industry. There were also several forums each day, with longer presentations with some ‘blue sky thinking’ from high profile people in the industry followed by a discussion session. Kirsti Karlsson and Nathan Young-Ziolkowski (Sales & Marketing Manager + Digital Editor at GEO ExPro) on booth and ready for the opening of the annual convention. Photo credit: Nathan Young-Ziolkowski. These forums have been developing over the years and give a good alternative to the detailed technical talks and posters. Topics covered in these included the popular Discovery Thinking Forum, which has become something of a feature in the AAPG programmes, as well as a forum entitled Great Innovation Leaders, where well-known industry influencers shared their insights into value creation through innovation. A highlight was definitely the presentation by the Head of the Bureau of Economic Geology’, Scott Tinker, in the Super Basin’s Forum. Always an inspiring and very entertaining speaker, Scott concluded his talk on ‘How super basins and shale plays may evolve’ by exhorting attendees to take their part in educating the public on the continuing need for oil and gas, even in an energy transition environment. One of the most popular forums was on the Business of Oil and Gas, where for several of the talks there was standing room only – an indication of how nowadays everyone exploring for oil and gas needs to understand commercial as well as the scientific aspects. 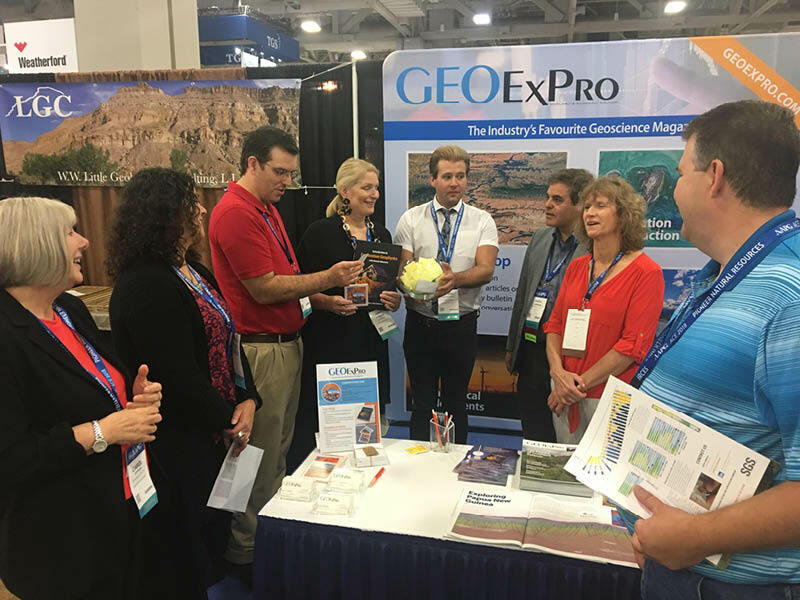 GEO ExPro staff; Kirsti, Jane & Nathan hosting the raffle to find the lucky winners of a book on exploration geophysics and two sets of geologically themed ceramic coasters. Photo credit: Nathan Young-Ziolkowski. A recurring theme in both the talks and on the exhibition floor was the increasing use of artificial intelligence and machine learning in the oil and gas industry. There were several companies specialising in this in the exhibition, while several others, like DrillingInfo, featured fascinating demonstrations of the way service companies use machine learning to speed up and improve functionality. There was even an event in one of the lecture rooms intriguingly entitled Machine Learning (Unsession)! Other notable technologies included interpretation software update releases and advances in cognitive interpretation and machine learning in geophysical interpretation. Alongside this, the introduction of virtual reality field trips from companies like PetroEDGE and Imaged Reality – using state of the art technology to bring a whole new level of outcrop learning from the other side of the world! As ever, there were plenty of opportunities for young people, both students and young professionals, to increase their knowledge of geosciences in the oil and gas industry, with dedicated sessions, careers boards and networking events. It was not uncommon to hear the phrase ‘things are getting better’ and this was certainly reflected in the enthusiasm of conference attendees and exhibitors alike. Next year the AAPG Annual Convention and Exhibition will set up camp in San Antonio, Texas, where we hope the predictions of improving economics will be realised with even more attendees and exhibitors. A few snaps of GEO ExPro staff enjoying a little extra-curricular fun on the side. 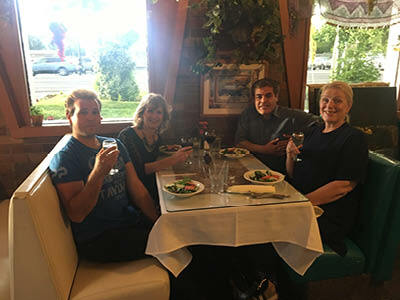 Left to right: Nathan, Jane, Associate Editor Rasoul Sorkhabi & Kirsti enjoying Persian-Greek Fusion cuisine at Cafe Med, Salt Lake City. Photo credit: Nathan Young-Ziolkowski. 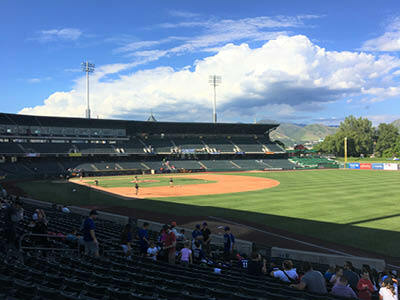 Smith's Ballpark, Salt Lake City. 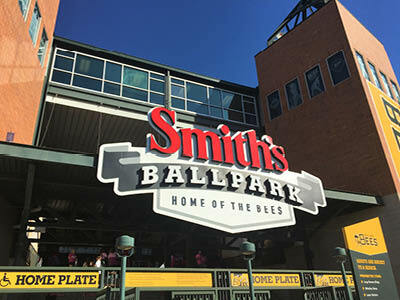 Home to the Salt Lake City Bees. Photo credit: Nathan Young-Ziolkowski. 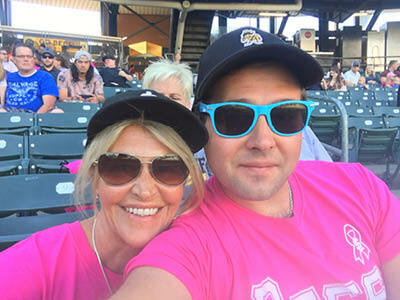 Left to right: Dawn van Zeelst (PGS) & Nathan (GEO ExPro) suited and booted in Salt Lake Bees memorabilia, pre-match. Photo credit: Nathan Young-Ziolkowski. 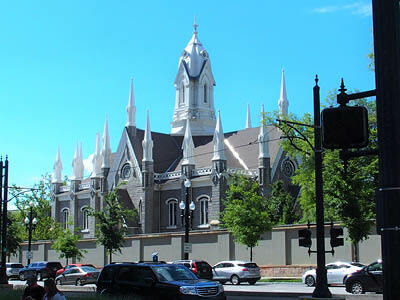 Sightseeing around Salt Lake City. Photo credit: Jane Whaley. PETEX 2018 lived up to its strapline: A New Optimism, bringing oil and gas professionals together from around the world at this the biennial meeting of the Petroleum Society of Great Britain (PESGB). Long overdue conference on the seismic characterisation of carbonate platforms and reservoirs at the Geological Society of London shows the way forward.